Meadowview is excited to support and join with BreakAway Outreach in various mission opportunities throughout the year. With a vision of helping kids “breakaway” from a troubled past, founders Jimmy and Cindy Larche began the organization primarily as a ministry to at-risk teens in South Florida juvenile detention centers. Over the years, this movement has grown into an international missions network impacting the next generation through youth camps, adventure programs, sports outreaches, leadership development, and compassion ministries. We are compelled by a “God-sized” vision that every young person from the margins of Chattanooga to the ends of the earth, might be afforded opportunities and resources for positive outcomes in their lives. For over a decade, Meadowview has ministered to the communities of Ameca and Guzman in central Mexico. We participate in construction projects, community outreach and help with Vacation Bible School. What a blessing it is to share the Gospel and serve alongside Pastors Hector and Julian and their congregations! Contact Pastor Al about opportunities to serve during future mission trips. 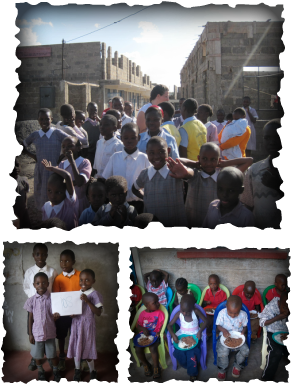 Would you like to sponsor a child in Nairobi? For only $10/month, you can help supply basic needs to orphans and children living in House of Mercy Children's Home. You will truly be blessed by this amazing ministry! We are in our 14th year of showing these children God’s great love for them personally! If you would like to help sponsor a child for $10/month, please contact Diane. Bags of Blessings is an opportunity for Meadowview to reach into our local community and serve as the hands and feet of Christ. This outreach project will continue during the entire school year. Weekly meal bags will be available for children who are food insecure at local elementary schools. Recent statistics reveal that about one out of three children are being raised in households during this tough economy that just do not have enough income to supply balanced meals each day. Many of these households have earned income too high to qualify for food stamps. The rising cost of groceries is an issue gripping more and more families every day. Sadly, families who used to just get by, well they simply aren't anymore. How can you help? Monetary donations and participating in our annual Mega Pack event in July. BreakAway Outreach - The Larches - Our MISSION is to empower the lives of at-risk youth, vulnerable children, and under-served communities with the life-changing message of Jesus Christ.